NanoPi M1 is H3 based development board produced by FriendlyARM. Feature-wise it is very similar to Orange Pi PC. Almost square board, blue soldermask, ⌀3mm mounting holes in the corners. 3 x USB type-A, Ethernet jack (with integrated magnetics) and four-pin header for UART/power near one of the edges. Sticker indicating amount of RAM is placed on the lower PCB side. The H3 SoC support has matured since its introduction in kernel 4.2. Most of the board functionality for boards such as NanoPi M1 are available with current mainline kernels. Some features (hw accelerated crypto, hw spinlocks, and thermal) are still being worked on. For a more comprehensive list of supported features, see the status matrix for mainline kernels. In addition, legacy 3.4 kernels are available in various work-in-progress git branches. NanoPi M1 shares nearly all hardware details with Orange Pi PC (same number of USB ports) and Orange Pi One (same voltage regulator). 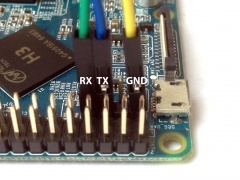 Besides the differences regarding camera connector and pins available on the GPIO header pretty similar to Orange Pi PC. Detailed device information can be found on FriendlyArm wiki. FriendlyARM's and 3rd partie's OS images can be found here. Armbian images with more recent u-boot and kernel versions can be found here. Use the nanopi_m1_defconfig build target (supported since v2017.07) build target. The U-Boot repository and toolchain is described in the Mainline U-Boot howto. Use the sun8i-h3-nanopi-m1.dtb device-tree binary. No FEL button. The device falls into FEL mode when no SD card is inserted. Four-pin UART0 header is placed next to 40 pin GPIO header. Pinout: GND, 5V, TX, RX. Pin 1 (GND) is the one next to Micro USB connector. Logic voltage is 3.3V. For more instructions refer to our UART Howto. FriendlyARM did the pcDuino4 nano as OEM for Linksprite which will be sold starting in September 2016. According to cnxsoft both models are compatible. 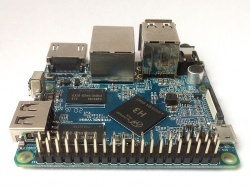 FriendlyARM introduced an improved version, the NanoPi M1+ in March 2017. This variant adds with 802.11n WiFi, Bluetooth, and integrated eMMC. All the connectors except for the micro USB OTG and camera ports are also on one side for easier access. The third USB port is provided via additional header pins. The positions of the HDMI and Ethernet ports have also been switched. This page was last modified on 7 December 2018, at 02:02.